Background: The global use, misuse, and abuse of broad-spectrum antibiotics coupled with failure of development of newer effective antibiotics have led to the rapid spread of carbapenemase producing Gram-negative Enterobacteriaceae. The lack of capacity for effective diagnosis results in increased morbidity, prolonged hospitalization, suboptimal treatment leading to treatment failure, and increased healthcare cost. Aims/objectives: We set out to determine the best method(s) for the phenotypic screening of carbapenem resistance among the species of Enterobacteriaceae at University of Maiduguri Teaching Hospital (UMTH). Materials and Methods: We screened all patients admitted into various wards/units of UMTH over a 6-month period to isolate Enterobacteriaceae. We used an interviewer-administered questionnaire to obtain some basic information from the patients. We confirmed the species of Enterobacteriaceae using Microbact Gram-negative 24E test kit. All confirmed isolates were screened for carbapenem resistance with Meropenem and Ertapenem antibiotic discs (10 μg, Oxoid, UK) according to the Clinical and Laboratory Standards Institute (CLSI) guideline. Minimum inhibitory concentration (MIC) using Etest of Imipenem (Biomeriux) was also determined based on CLSI recommendations. Modified Hodge test method was considered as a gold standard for confirmatory test. The three methods were compared with the gold standard. Results: We isolated 225 Enterobacteriaceae from 225 patients. Klebsiella pneumoniae had the highest proportion of 73 (32.4%). The sensitivity of the different methods in increasing order was 95.7% for Meropenem disk (10 μg), 100% for Ertapenem disk (10 μg), and 100% for Imipenem MIC. Conclusion: In view of cost and availability, the Ertapenem disc (10 μg) method can be used for the screening of carbapenem-resistant Enterobacteriaceae. For the routine screening of carbapenem resistance Enterobacteriaceae in our clinical laboratories, the Ertapenem disc (10 μg) method is recommended. Antimicrobial resistance has become a global health security issue necessitating a global concerted effort. Carbapenems are the drugs of last resort for treating resistant Gram-negative bacteria. However, resistance to carbapenems has now emerged worldwide. This resistance impacts negatively on the quality of patient care and results in prolonged hospitalization and increase in healthcare cost. The value of an effective, timely, and cost-effective laboratory detection of carbapenem resistance Enterobacteriaceae (CRE) in our clinical laboratories cannot be overemphasized. The Clinical and Laboratory Standards Institute (CLSI) has set up guidelines for the detection of CRE in clinical settings. However, these guidelines might not have been fully evaluated to adapt to resource-poor settings. Consequently, we set out to evaluate three methods for the detection of carbapenem-resistant Enterobacteriaceae in our setting. Study area: The study was conducted at the University of Maiduguri Teaching Hospital (UMTH), Maiduguri, Borno State, north-eastern Nigeria. Study design: The study was a hospital-based, descriptive, and cross-sectional. Study population: The study was conducted on patients hospitalized in UMTH from the following wards: medical ward (male and female), surgical ward (male and female), special care baby unit, and the intensive care unit. Sample size: A sample of 225 species of Enterobacteriaceae was isolated during the study period. Sampling method: Nonprobability (convenient) purposive type of sampling. Specimen collection and transportation: The isolates were obtained from the following specimens: blood, urine, cerebrospinal fluid, stool, and swabs of patients with invasive diseases (i.e., bloodstream infections, catheter related infections, ventilator assisted infections, etc.). All specimens were collected and transported according to the standard methods. Bacterial identification and characterization: Specimens were inoculated on MacConkey agar. They were then incubated for 24 h aerobically at 36–37°C, colonial appearance and characteristics of isolates on MacConkey agar were noted, and they were then subjected to Gram-staining methods according to the standard methods and also motility testing. All suspected isolates of Enterobacteriaceae were confirmed by the Microbact Gram-negative identification system™ (Oxoid, UK) 24E according to the manufacturer’s instructions. Phenotypic screening for carbapenemases: All the bacterial isolates were screened for carbapenemases according to the CLSI guidelines. Ertapenem and Meropenem discs (10 μg, Oxoid, UK) were used. The antibiotic discs were placed on the surface of inoculated Mueller Hinton agar plates using sterile forceps. The discs were placed about 30 mm apart and the plates were incubated for 24 h at 37°C after which zones of inhibitions were read. Isolates that showed a zone of inhibition ≤21 mm in diameter for Meropenem and/or Ertapenem were considered as suspected carbapenemase producers. Escherichia More Details coli ATCC 25922 was used to quality controlled the screening test. Determination of minimum inhibitory concentration (MIC) to Imipenem by the use of Etest: All the species of Enterobacteriaceae isolates were also simultaneously tested for their MIC using Imipenem E-Strip. Any concentration at or above 2–8 μg/ml was considered resistant based on the CLSI guidelines for broth microdilution methods. Phenotypic confirmation for carbapenemases (modified Hodge test): All the Enterobacteriaceae isolates were subjected to confirmatory testing using the modified Hodge test which is to serve as the gold standard for the three methods. A 0.5 McFarland standard of E. coli ATCC® 25922 was inoculated in saline and diluted to 1:10 in saline. This suspension was then evenly inoculated with a sterile cotton swab on the surface of Mueller Hinton agar plate. A disc of Ertapenem (10 μg, Oxoid, UK) was placed on the surface of Mueller Hinton agar plates at the centre. Thereafter, by means of a sterilized wire loop, the test organism was streaked together with the two quality control organisms (Klebsiella pneumoniae ATCC® BAA-1705-modified hodge test (MHT) positive and K. pneumoniae ATCC® BAA-1706-MHT negative) in a straight line out from the edge of the Ertapenem disc. The plates were then incubated at 37°C for 24 h. Positivity for carbapenem was inferred when there is the appearance of a clover leaf type indentation or flattening at the intersection of the test organism and E. coli ATCC 25922 within the zone of inhibition of the carbapenem susceptibility disc as described by Anderson and recommended by CLSI., K. pneumoniae ATCC® BAA-1705-MHT positive and K. pneumoniae ATCC® BAA-1706-MHT negative were used as positive and negative controls for MHT, respectively. Ethical clearance was obtained from the institutional review board of UMTH, Maiduguri, Nigeria. The sociodemographics of the participants are as shown in [Table 1]. A total of 99 (44%) of the patients were adults of more than 25 years old while 122 (54.2%) were males with a male:female ratio of 1:1.8. The Kanuri race was the most predominant tribe of the patients representing 58 (25.8%) while 124 (55.1%) of the participants reside in rural area. 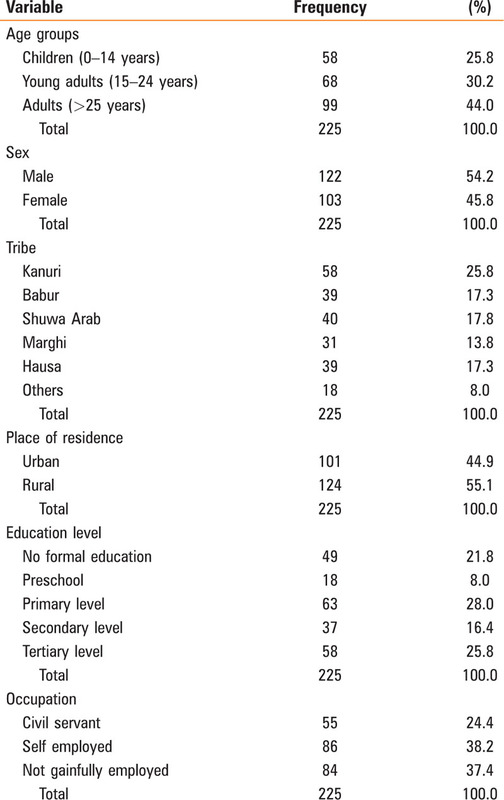 A total of 63 (28%) of the patients had the primary level of education while 86 (38.2%) were self-employed. A total of 225 species of Enterobacteriaceae were isolated during the study period. This is summarized in [Table 2]. K. pneumoniae has the highest proportion of 73 (32.4%) followed closely by E. coli with 61 (27.1%) while Citrobacter sedlakii has the least proportion of 2 (0.9%). Majority of the species of Enterobacteriaceae were obtained from the patients in medical ward with 75 (33.3%) and this was followed closely by surgical ward with 69 (30.7%). This is shown in [Figure 1]. The specimens from where the various organisms were isolated were as shown in [Table 3]. A total of 115 (51.1%) clinical isolates of Enterobacteriaceae were obtained from urine, 45 (20.0%) from blood specimen, 31 (13.8%) from swabs, 21 (9.3%) from sputum, and 13 (5.8%) from cerebrospinal fluid [Table 4]. [Table 4] shows the carbapenem susceptibility from the three different methods. 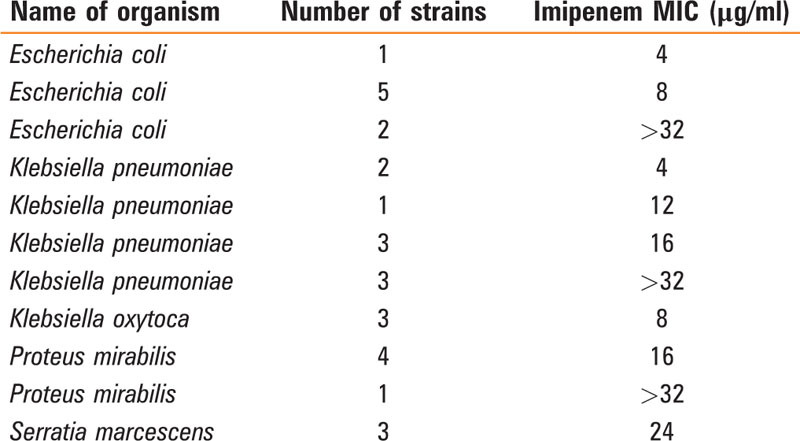 The MIC reading of Imipenem using Etest for all the Enterobacteriaceae isolates is as shown in [Table 5]. The reading of 4, 8, and >32 μg/ml was recorded for the respective strains of E. coli while for K. pneumoniae the respective readings were 4, 12, 16, and >32 μg/ml. The values of 16 and >32 μg/ml were recorded for Proteus mirabilis strain. The readings of 8 and 24 μg/ml were recorded for Klebsiella oxytoca and Serratia marcescens, respectively. The result using Meropenem disc (10 μg) in the screening of CRE is as depicted in [Table 6]. Twenty-two CRE were detected as compared to 23 being detected by the gold standard. Therefore, this gives a sensitivity of 95.7% and a specificity of 99.5% with a predictive value positive of 95.7% and predictive value negative of 99.5%. The results using the Ertapenem disc (10 μg) in the screening of CRE is as shown in [Table 7]. Twenty-three of the CRE were positive using the Ertapenem method while the gold standard detected 28 CRE. The sensitivity was 100% and specificity of 97.5%, while the predictive value positive was 82.1% while the predictive value negative was 100%. However, the results using the Imipenem MIC in the screening of CRE are as shown in [Table 8]. Twenty-three of the CRE were positive using the Imipenem method while the gold standard detected 28 CRE. The sensitivity was 100% and specificity of 97.5%, while the predictive value positive was 82.1% while the predictive value negative was 100%. The global spread of CRE has become necessary for laboratories to adapt efficient and effective method of laboratory detection. The CLSI have developed guidelines for detecting this resistant threat. However, clinical laboratories in developing countries need to balance up between cost and quality within a good turn-around time. High sensitivity and specificity is necessary for any one method to be effective. We take into consideration the three main carbapenems used in the clinical practice (Meropenem, Ertapenem, and Imipenem). The Meropenem disk was recognized to offer a good compromise in terms of sensitivity and specificity for the detection of CRE in a study by Willems et al. to determine phenotypic screening strategy for emerging beta lactamases in Gram-negative bacilli. However, from our study, Meropenem disk recorded the lowest relative sensitivity and specificity. This may be unrelated to the fact that Meropenem has been reported to have some drawback when used as a standalone screening tool for Gram-negative resistance although other studies have shown good detection with Meropenem disk but it has not been used as the superior detection method. The findings from our study have shown that Ertapenem offers the best sensitivity and specificity as a single disk method comparable only to the Imipenem MIC. This is not surprising since Ertapenem nonsusceptibility is the most sensitive indicator for the detection of CRE. The Imipenem disk test performs poorly as a screening tool for carbapenemases, and consequently we used Imipenem MIC in our study. Imipenem is the only agent whose MIC was determined from this study, though some studies have shown MIC determination to be superior to the disk diffusion method. Yusuf et al. in Kano reported a 7.4% resistance to Imipenem and 87.5% resistance to Meropenem among Enterobacteriaceae using the same study design from the same institution but in a different patient population., There was large difference in the MIC of Imipenem using Etest method as observed in this study; the values range from 4 to >32 μg/ml. This is partly because Imipenem MICs of 4 μg/ml were considered susceptible by the old CLSI criteria but resistant by the new CLSI criteria. Although in this study only Imipenem Etest was used, it is generally believed that nowadays isolates of Enterobacteriaceae present with higher MICs against Imipenem compared to other carbapenem agents. In contrast to this finding, two studies conducted in Taiwan detected lower rates of susceptibility to Imipenem in P. mirabilis (9 and 26.5%) following the application of revised CLSI criteria. The use of Etest for the different carbapenem class antibiotics would have painted a better picture of the MIC susceptibility for the different strains of Enterobacteriaceae.,The MHT has been used as gold standard for phenotypic confirmation for a long time; consequently, we used MHT as our gold standard to compare the various methods. Finally, our results observed that all the methods offer compromise between sensitivity and specificity in terms of the detection of carbapenemase producers. All the three methods showed a relatively high sensitivity and specificity but the Ertapenem disc (10 μg) and Imipenem MIC showed superior detection as compared to Meropenem disc. In view of this, we recommend that either of them can be used for the routine screening of carbapenem-resistant Enterobacteriaceae in our clinical laboratories. Brink AJ, Feldman C, Richard GA. Emergence of extensive drug resistance (XDR) among Gram negative bacilli in South Africa looms nearer. S Afr Med J 2008;98:586-92. Winn W, Allen S, Janda W, Koneman E, Procop G, Schreckenberger P et al. Introduction. Koneman’s Color Atlas and Text Book of Diagnostic Microbiology. Baltimore and Philadelphia: Lippincott Williams & Wilkins; 2006. p. 21-5. CLSI. Performance Standards for Antimicrobial Susceptibility Testing: Twenty-First Informational Supplement. CLSI Document M100-S21. Wayne, PA: Clinical and Laboratory Standard Institute; 2011. Anderson KF, Lonsway DR, Rasheed JK, Biddle J, Jensen B, McDougal LK. Evaluation of methods to identify the Klebsiella pneumoniae carbapenemase in Enterobacteriaceae. J Clin Microbiol 2007;45:2723-5. Willems E, Verhaegen J, Magerman K, Nys S, Cartuyvels R. Towards a phenotypic screening strategy for emerging beta-lactamases in Gram-negative bacilli. 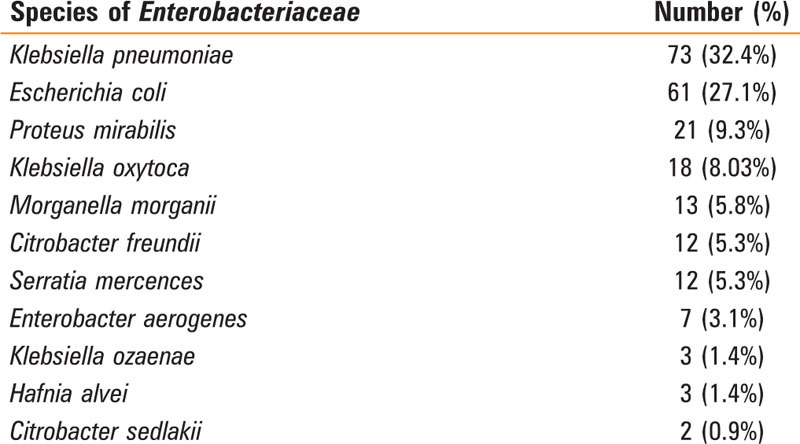 Int J Antimicrob Agents 2013;41:99-109. Perrott J, Mabasa VH, Ensom MH. Comparing outcomes of Meropenem administration strategies based on pharmacokinetic and pharmacodynamic principles: A qualitative systematic review. Ann Pharmacother 2010;44:557-64. Tsakris A, Poulou A, Pournaras S, Voulgari E, Vrioni G, Themeli-Digalaki K et al. A simple phenotypic method for the differentiation of metallo-beta-lactamases and class A KPC carbapenemases in Enterobacteriaceae clinical isolates. J Antimicrob Chemother 2010;65:1664-71. 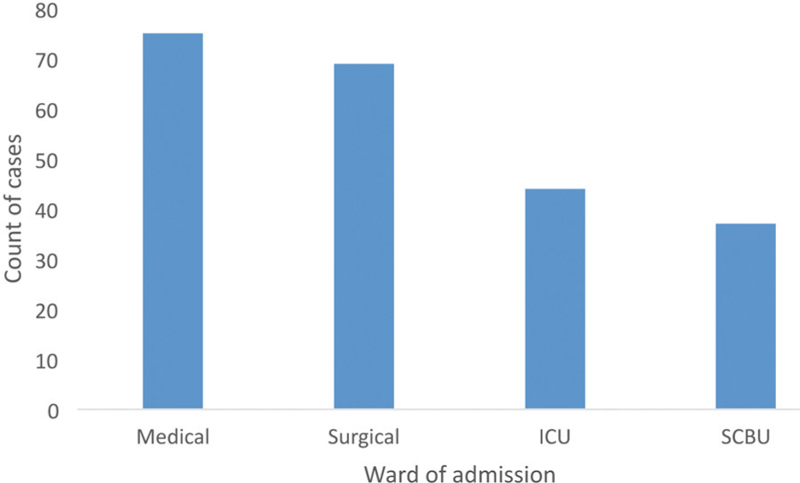 Yusuf I, Arzai AH, Getso MI, Sherif A, Haruna M. Emergence of carbapenem resistant Enterobacteriaceae in surgical and intensive care units of a hospital with low usage of carbapenem in Kano, North West Nigeria. Antimicrob Resist Infect Control 2013;2:75-8. Yusuf I, Magashi AM, Firdausi FS, Sharif AA, Getso MI, Bala JA et al. Phenotypic detection of carbapenemases in members of Enterobacteriacea in Kano, Nigeria. Int J Sci Tech 2012;2:802-6. Landman D, Bratu S, Kochar S, Panwar M, Trehan M, Doymaz M et al. Evolution of antimicrobial resistance among Pseudomonas aeruginosa, Acinetobacter baumannii and Klebsiella pneumoniae in Brooklyn, NY. J Antimicrob Chemother 2007;60:78-82. Jennifer C, Adrian B. The emergence of carbapenem resistance in Enterobacteriaceae in South Africa. S Afr J Epidemiol Infect 2011;26:239-40. Rapp RP, Urban C. Klebsiella pneumoniae carbapenemases in Enterobacteriaceae: History, evolution, and microbiology concerns. Pharmacotherapy 2012;32:399-407. Girlich D, Poirel L, Nordmann P. Value of the modified Hodge test for detection of emerging carbapenemases in Enterobacteriaceae. J Clin Microbiol 2012;50:477-9.